« Will This Be An Ugly Offseason for DeSean Jackson? 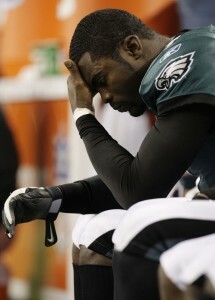 Vick a ‘for-sure’ not to be back in the 2010 season? The Philadelphia Daily News reports that it looks as if Mike Vick won’t be back in 2010, as he’s due to make $5 mil next season, and if he’s not going have a much bigger role on the team, there’s no reason to have him sitting the bench making more than a number of bigger players on the team. Eagles quarterback Michael Vick, who wants another starting opportunity in the NFL and is scheduled to make $5 million next season, almost certainly won’t be back. A league source confirmed to the Daily News that head coach Andy Reid already assured Vick he will trade him before the April draft. Its unlikely the Eagles will pick up Vick’s $5 Million option in 2010. There’s quite a few teams that will take a look at Vick if he hits the open market, like the Rams, Raiders and possibly even the Cardinals now that Kurt Warner has retired. It will be interesting to see what the future holds for Vick, and if he will be able to be a starter elsewhere.